Downland is formed when chalk formations are raised above the surrounding rocks. The chalk slowly erodes to form characteristic rolling hills and valleys. As the Cretaceous chalk layer in southern England is typically tilted, chalk downland formations often have a marked scarp slope on one side, which is very steep, and a dip slope on the other, which is much shallower. 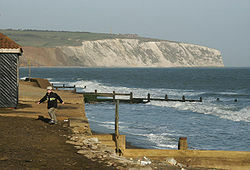 Where the downs meet the sea, characteristic white chalk cliffs form, such as the White Cliffs of Dover and Beachy Head. Chalk deposits are very porous, so the height of the water table in chalk hills rises in winter and falls in summer. This leads to characteristic chalk downland features such as dry valleys or coombes, and seasonally-flowing streams or winterbournes. The modern practice of extracting water from this 'reservoir', in order to satisfy demand for water, may be putting some of these streams under extreme stress. In the valleys below the downs there is typically a clay soil, and at the interface between the two a springline can occur where water emerges from the porous chalk. Along this line, settlements and farms were often built, as on the higher land no water was available. This is demonstrated very clearly beneath the scarp of the White Horse Hills, above the Vale of White Horse. In many chalk downland areas there is no surface water at all other than artificially created dewponds. The soil profile of chalk downland in England is a thin soil overlaying the parent chalk. Weathering of the chalk has created a characteristic soil known as rendzina. Unlike many soils in which there are easily distinguished layers or soil horizons, a chalk rendzina soil consists of only a shallow dark humus rich surface layer which grades through a lighter brown hillwash containing small pellets of chalk, to the white of the chalk itself. This is largely because of the purity of the chalk, which is about 98% calcium carbonate, and the consequent absence of soil-building clay minerals which are abundant, for example, in valley floors. Steep slopes on chalk downland develop a ribbed pattern of grass covered horizontal steps a foot or two high. Although subsequently emphasised by cattle and sheep walking along them, these terracettes (commonly known as sheep tracks) were formed by the movement of soil downhill, a process known as soil creep. In temperate regions chalk downland is typically calcareous grassland, a habitat formed by grazing from both livestock and wild animals. Chalk downland is often unsuitable for intensive agriculture, horticulture, or development because of the nutrient-poor, shallow soil and difficult slopes. For this reason downland often survived uncultivated when other, more easily worked land was ploughed or reseeded. This shallow soil structure makes downland ecosystems extremely fragile and easy to destroy. With modern machinery and fertilizing techniques, it has become possible to use some previously uncultivated downland for farming, and the decline of extensive grazing has meant that many areas of downland, neither cultivated nor grazed, revert to scrub or other less rare habitat, essentially destroying the delicate calcareous grassland. The UK cover of lowland calcareous grassland has suffered a sharp decline in extent since the middle of the twentieth century. There are no comprehensive figures, but a sample of chalk sites in England surveyed in 1966 and 1980 showed a 20% loss in that period and an assessment of chalk grassland in Dorset found that over 50% had been lost between the mid-1950s and the early 1990s. Much remaining chalk downland has been protected against future development to preserve its unique biodiversity. Wikimedia Commons has media related to Downland. Look up downland in Wiktionary, the free dictionary. This page was last edited on 26 December 2018, at 22:32 (UTC).